At twenty-six, Shinjini Das is the full-time CEO of her own media content production agency. 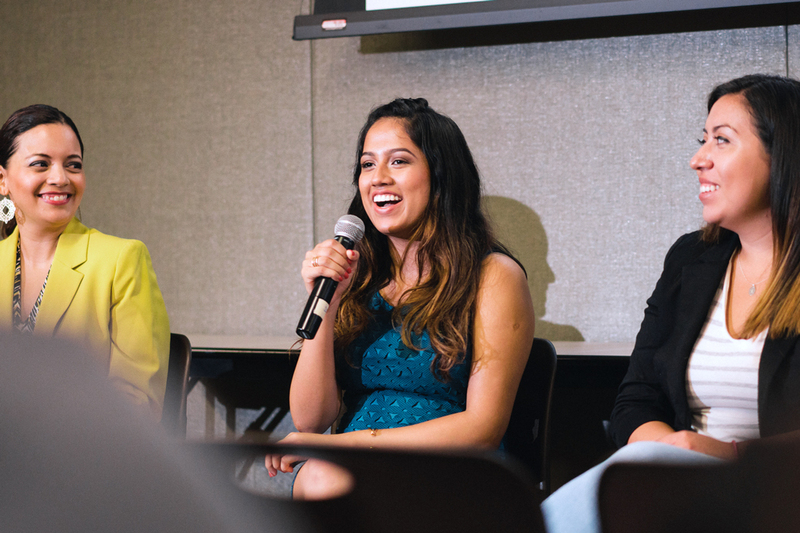 Recently, she’s been helping aspiring Latina engineers become their own self-made success stories. How does one say “go-getter” in Spanish? According to Shinjini Das, you can’t. So, when the US Department of State invited Das to empower Latino youth in Paraguay in October 2017, she decided to keep the word in English, despite the rest of her presentations being entirely in Spanish. After all, she’s a self-styled “Go-Getter Girl.” The word is the very cornerstone of her brand and part of why each of her events during the week-long sojourn was at capacity. Das—who has nearly three million impressions a month on her social channels—believes it’s important for her fans all across the world to hear the word “go-getter” so they can be go-getters, too. 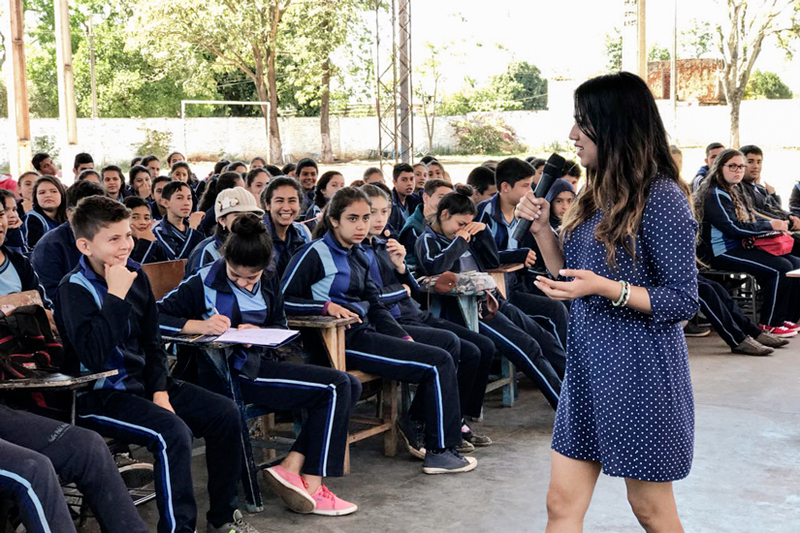 Throughout her travels in Paraguay, the twenty-six-year-old Das spoke in Spanish to thousands of youth, college students, and adults about everything from self-empowerment to building a career trajectory, business growth, and digital marketing strategies. The Department of State asked her to make the trip as a keynote speaker with the US Speaker Program because of her own success and background as a Spanish-language expert. Although Das, herself, is Indian, she discovered her love of Spanish culture in high school after she moved to the United States, becoming fluent in the language. Now, she is focusing much of her media content production agency, Das Media Group, on empowering women in the Hispanic community. “The genesis of the brand was, ‘Why can’t we celebrate accomplishments, specifically with women?’” Das says. “’What if we used the media to empower people?’” She points out that, in the Latin American community, the biggest role models aren’t usually recognized for their educational backgrounds or academic skills. “They’re essentially the footballers and the supermodels,” Das says. She also stresses that while it’s important to have public figures celebrated for athletic prowess and fashion savvy, it’s equally important to have highly visible, popular role models in the fields of science, math, and other educational areas. When she went to Paraguay, many of the students told her they were eager to look up to someone with an advanced degree or accomplished educational background. Part of Das’s mission is to bridge this content gap between intellect and pop culture in the media. That’s why she doesn’t shy away from being vocal about her own background. In addition to speaking three languages, she has a bachelor of science in industrial and systems engineering from the Georgia Institute of Technology, where she graduated with honors and served as the undergraduate commencement speaker. Following graduation, she worked as a business technology analyst at Deloitte Consulting and as a digital marketing strategy associate at Iron Horse Interactive before she was able to go full-time with Das Media Group in 2016. When she describes these accomplishments, it’s not about presenting her career so far as a laundry list of goals; it’s about showing people that their dreams are within their grasp, just like hers were. Simple awareness, Das says, is one of the biggest hurdles faced by women of color looking to fully realize their ambition. “If the market is saturated by the same four people, it’s difficult for those who don’t have resources to start with,” Das says. She wants to be one of those resources, especially to those wanting to break into engineering, a field where, in the United States, women hold only 13 percent of jobs. The percentage of Hispanic women holding engineering positions is even smaller; just 2 percent overall, according to an October 2017 study by the National Science Foundation. As a highly successful woman of color with a background in engineering, she stands outside of the majority. Das believes the second biggest hurdle is networking. She wants to change that. She wants to be there as a connector, a bridge-builder, and a person who expands young Latinas’ own networks and makes them realize their world isn’t as small as they think. And many have by attending one of her speaking events in Paraguay, listening to a variety of podcast interviews on Das Media Group’s website and on C-Suite Radio, and reading her coverage in publications such as Forbes. The appeal of her content isn’t just limited to individuals, either. Despite being not even two years old, Das Media Group has already partnered with several internationally recognized businesses to produce empowering media in a variety of formats. For instance, Chase for Business commissioned the company for a ten-part video series that provided small-business entrepreneurs with early- to mid-phase growth strategies. It generated more than 2.4 million impressions. Likewise, 2018’s SXSW saw Das Media Group partnering with Intuit to create image, photo, and video messaging that asked small business owners to nominate female entrepreneurs for their #GirlOnFire campaign. Over the next five years, Das is looking to expand her actionable content available to other go-getters by building a full-on digital media platform—one brimming with self-help videos, interactive media experiences, and perhaps TV series and films to help go-getters become the best they can in both their careers and lives. But in the present, Das remains primarily committed to the continued growth of client partnerships at her agency and being a role model to many women of color who might be missing one. At age twenty-six, she looks forward to meeting those women face to face on an upcoming book tour of her first memoir—Unapologetically, Shinjini—as well as at future speaking engagements. Das calls her fans her #GoGetterFam because, to her, go-getters are not just fans; they’re family. Partner with The Das Media Group to create content with meaning and to build deeper brand connections with your audience.